Hi! It's Dona (orange gearle), back with a card I made for The Rubber Cafe, featuring the Take Flight Creative Cafe Kit and the bonus add-on stamp set, Winging It. The patterned papers in the 6x6 pad from Carta Bella are fantastic! I knew from the moment I opened my kit that I wanted to use these papers together! For the base I used the dark, red card stock, cut and folded to 5 & 1/2" by 4&1/4". Next, I grabbed the three coordinating pieces of paper that I fell in love with from the 6x6 Carta Bella Moments & Memories paper pad (included in the kit). I cut the flower paper to 2 1/4", the green to 1 3/4" and the thin strip of polkadot paper to 1/2". I glued them to the base with Scrap Happy Glue (polkadot paper last). Then came the fun! 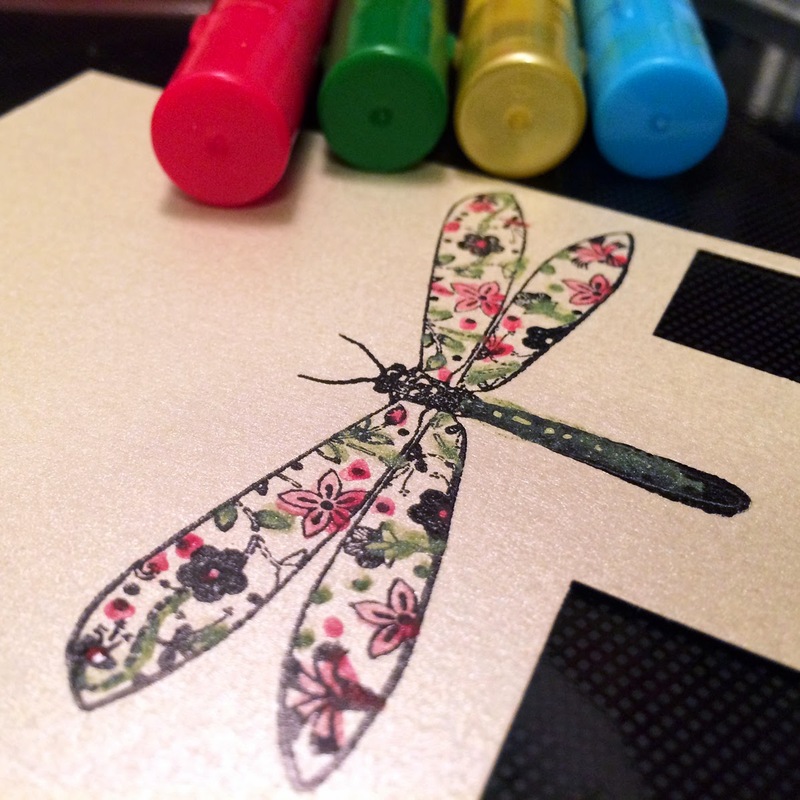 I grabbed the dragonfly stamp, Memento ink and that lovely shimmering card stock. 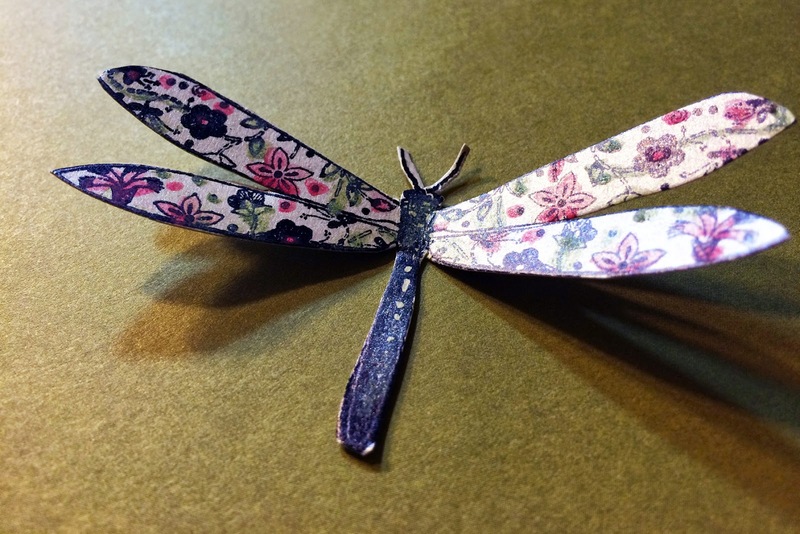 I stamped the dragonfly and then decided I wanted to get out one of my favorite things -- gelatos by Faber-Castell DMC. I mixed the green, gold and a little blue to make an olive green to match the paper. I did this by shaving off a little of each of those colors and adding a little water before mixing with a brush. Then I applied the green and red with a thin brush. 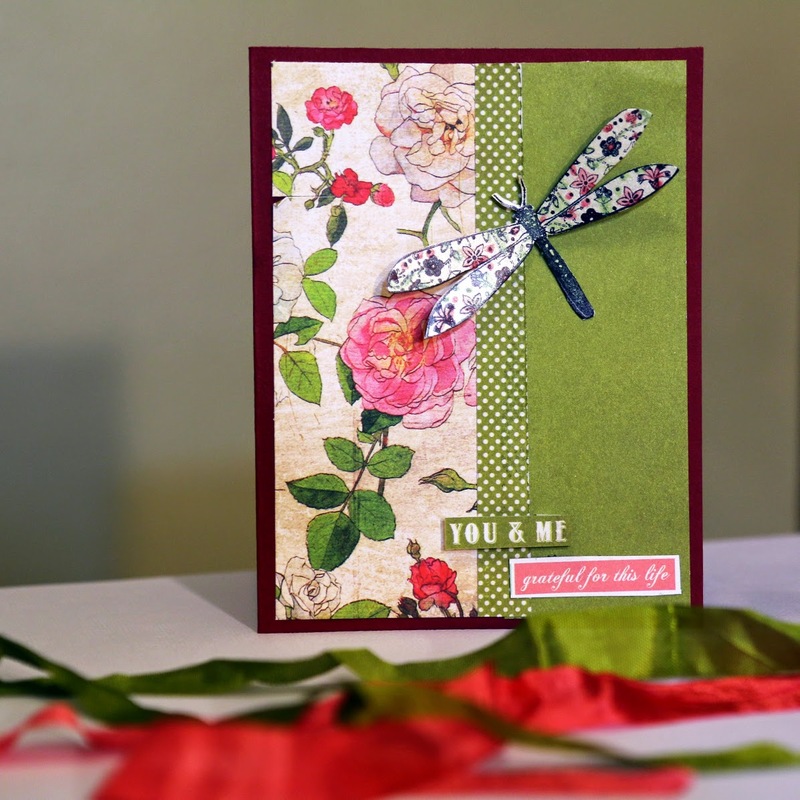 The shimmering background of the card stock only add to the look! I love how it turned out! Next I fussy cut it out of the card stock, used Scrap Happy Glue on the body, and a 3D foam square at the base of each wing to give it a pop -- and on the card it went! 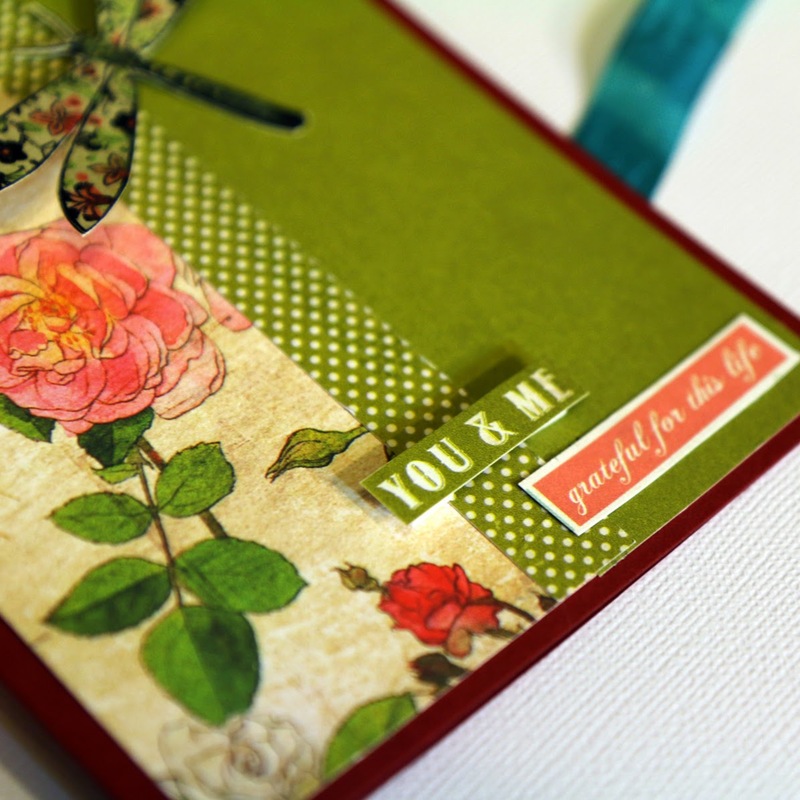 Finally, I cut the phrases "You & Me" and "grateful for this life" out of one of the patterned papers included in the 6x6 pad and attached them as my message (I popped up the You & Me to add a bit of interest and texture). This was a fun one to make! Thank you for the opportunity to make and share this card with you all! 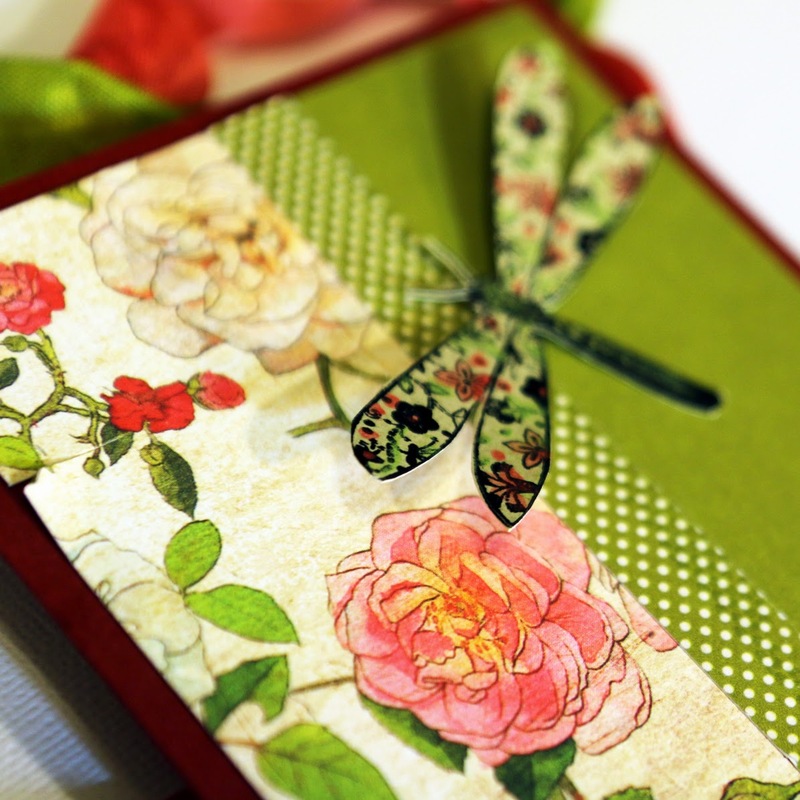 Stamps: The Rubber Café – Creative Café kit of the Month ; Take Flight; The dragonfly stamp is from the (bonus add-on) "Winging It" stamp set.